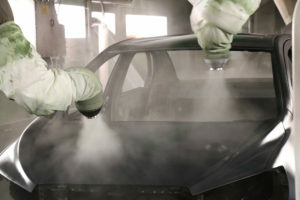 Along with revealing General Motors’ serious consideration of an collision repair network, an executive for the automaker shared a few other interesting updates about OEM body shop-related initiatives on Thursday. First, MyPriceLink, which GM wholesale dealer channel manager John Eck joked was likely to come up in the Thursday Guild21 presentation’s Q&A anyway. “MyPriceLink is going very well,” he said. List prices are appearing as an estimate is written on software like CCC, Mitchell or AudaExplore, and response time is less than a second, according to Eck — “excellent” considering MyPriceLink gets millions of hits per day. This lack of complication after what ended up being an uneventful launch might make the bigger news Eck’s announcement of what’s coming to the recently revamped GM Genuine Parts website for professionals: a paint code offering. “Coming soon, I am promised … we will have a complete paint code section on this website, something that we have desperately been needing for years,” Eck said. A customer-facing touch-up paint code database already exists on the site, and Eck said GM offered more information shops could use to interact with owners on the new www.genuinegmparts.com as well. That site soon could see some new position statements from General Motors’ marketing team, according to Eck. “Many are actually in final review” and undergoing the approval process from engineers and attorneys, he said. General Motors also has talked to the estimating services about integrating repair procedures, Eck said. Earlier, he referenced a desire from the OEM to integrate correct procedures and policies at the estimate writing stage and drive parts selection with an eye towards OEM repair standards. Toyota last year launched a repair procedures integration with Mitchell, and a representative for that OEM said in an SCRS-Collision Hub video it’s leading to better work by shops. Finally Eck indicated some sort of work with OnStar was planned by his GM segment, and the company was discussing it with insurers “willing to engage with us” as well. “They (OnStar) are fully on board in helping us improve the customer experience,” he said, and the driver assistance service — a GM subsidiary — also wanted to deliver a fast, “pre-crash OE condition” repair.